Eliminate the need to print, sign and return paper documents by using our electronic document acceptance solution. Send your customer a secure document via email or allow them to retrieve it from your portal. They can approve the document by clicking on an ‘Accept’ button. A record of the acceptance is made available to your internal systems. 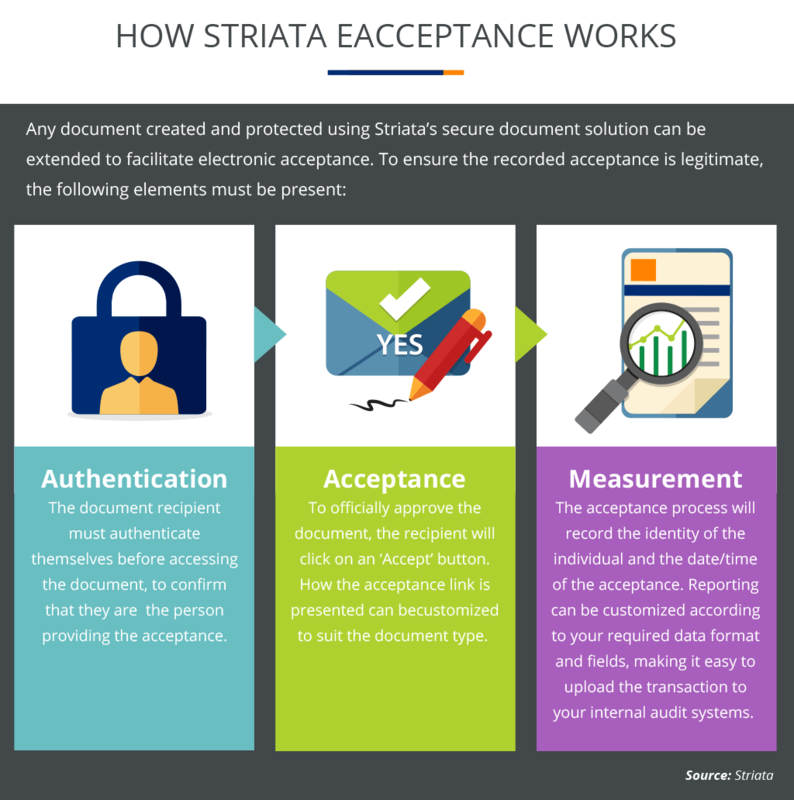 Note that the electronic acceptance process is different from digitally signing a document. Get colleagues or customers to approve documents faster by enabling electronic acceptance within the document. Reduce costs relating to printing, circulating and storing a document. Your customer’s information is secure throughout the processing, distribution and storage of data. Our process adheres to anti-phishing standards and uses techniques that make it difficult to mimic or exploit. Find out how to get policies, important documents and contracts sent to customers as secure PDF attachments via email and signed quickly and easily from the attached PDF with Striata eSignature.